Everything was in order and I signed what was for me a huge check and handed it over. We made arrangements for Tea to be delivered to a trainer I had selected who would work with her to bring her back into shape, get her fit, and tune up her dressage education. I planned on having the mare there for a few months, then taking her home as my new partner to continue our mutual education. That was 17 February. Dressed for Tea was dropped off at the new trainer’s farm with advice/warning (?) from the old trainer that the mare had been ridden as a “crank and spank”, which in dressage terms means she has to be cranked in and held on the bit and “encouraged” to go forward. Tea was a bit underweight, so the new Trainer gave her about a week to settle in. When she finally did get on her, it was quite a shock. The next day after the trainer’s first ride I was anxious to hear how she went. My trainer softened the report for my sake. She extolled the virtues of Tea’s disposition (ridden in a thunderstorm and didn’t turn a hair), but she was worried about her left stifle, SI joint, loins, and hips, which were so incredibly tight that she could not take long steps in the trot. In fact, she was covering only 2 feet or less. I knew she could start a bit stiff, but had no idea how bad it was until I managed to get on her the following week. To say her steps were short was an understatement. She was like a foot-bound woman in a tight skirt. She did not want to move forward, in fact, even when encouraged she couldn’t. She felt crippled. I jumped off in a panic and ran back to the barn. What had happened to her? What was wrong? Thus began the months-long journey to find out what exactly was going on to make her so stiff, so sore, so unridable. We took her off grass and put her on a low-carb diet. Muscle enzyme blood test analysis showed that was not the problem. We got an expert saddle fitter, who saw that she preferred a flexible tree so I bought a new, made-to-fit saddle for her. But she was still moving like her back was fused and her legs were sticks without any joints. 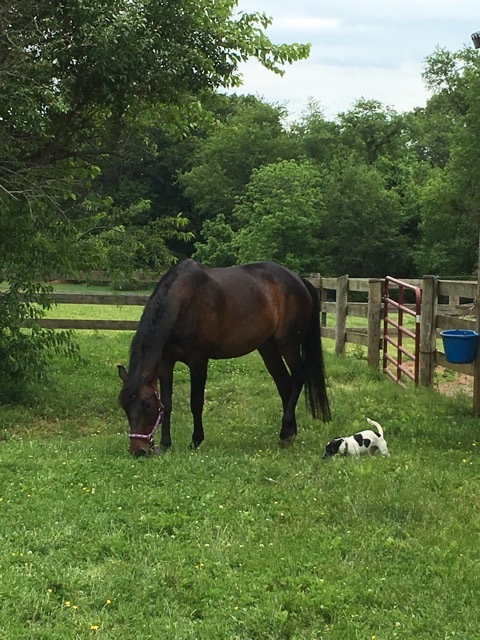 I had the barn’s vet examine her on March 9th and he said she was not flexing her hocks and had a hip/SI joint problem, “and probably more.” I took his recommendation and had her hocks injected and put her on a muscle relaxer, methocarbamol. There was modest improvement, but her left hind was still weak. Tea has such a great attitude, even with her physical issues she tries her heart out. Training continued and she did develop better muscling and more strength, but it was a struggle. There was still something terribly wrong. My vet examined her and noticed a severe dip in her neck where it meets the shoulder on the left side. He was concerned that it might be damaged, adversely affecting the whole apparatus of connective tissue along the shoulder, back, etc. On April 17th he injected her neck with hyaluronic acid (HA) and a cocktail of other things. It didn’t help much. On May 15th he watched her go again. She was doing better, but he could see the problem in her hips/hind end. He gave the same type injection in a triangle of tissue around the SI joint. It helped a little, but only for a while. I was running out of money. I hadn’t planned on a new saddle and costly veterinary intervention plus a long period with a professional trainer. And then she started to act lame on her left hind. It was time to take more drastic measures. At the end of May I brought Tea home to my farm until such time as we could find out what was wrong with her. My vet recommended nuclear scintigraphy – otherwise known as a bone scan — to really find out what was going on. I had been down this sad road before with not one but two other horses. The Virigina Equine Imaging facility does a great job, but I wasn’t prepared for this additional expense. I could not believe I was looking at having to do it again. In the meantime, the vet said she would benefit from having the actual SI joint injected. So on June 1st, the vet injected directly into the SI joint on both sides with the assistance of an ultrasound. The examination revealed that Tea has a luxated SI joint (tilted out of place) and so much fibrous tissue on the left side of her hip that he could barely get the needle through it. Something had happened to her. At least now I know there is something wrong with her and she is not just a lazy or obstinate mare. You see, she wasn’t really a “crank and spank” horse, but rather one who was getting by the best she could with some rather serious physical limitations. And yet, she still has a willing attitude. Now, I have to see what we can do to help Tea. Gosh, I wish you the very best and can’t wait to hear what happens next! Moonie had his SI joint injected at Va Equine Imaging a while back. Would love to chat about these things and what the follow-up means at length some time…!